For Matt Clarke, it was one game and three central-defensive partners. No wonder Pompey slumped to defeat against struggling Oldham in the worst performance of Kenny Jackett’s reign. The Blues find themselves in the midst of a defensive crisis following Saturday’s dismal 2-1 defeat. And Clarke is the last man standing as the only fit senior centre-half. Christian Burgess was ruled out of action with a calf problem in the build-up to the Latics’ visit. With Jack Whatmough already sidelined through knee ligament damage, Nathan Thompson was asked to stand in. 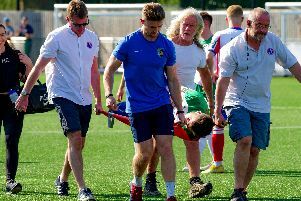 Yet his involvement lasted only 22 minutes before he was stretchered off following a clash of heads with Drew Talbot as the pair leapt for the same ball. Talbot then slotted alongside Clarke for the remaining 23 minutes of the first half – only for Oli Hawkins to drop back from attack during an interval reshuffle. The Clarke/Hawkins axis remained intact for the entire second half, yet couldn’t prevent defeat. Of course, defensive injuries were merely a contributing factor in an awful Blues display overall. Yet having to adjust to three partners was a unique experience for Clarke. He said: ‘It was a weird one playing with three partners. ‘You have two if someone gets injured, but three is a bit too much really! ‘Still, we train together every day so you’d like to think you know everyone in the squad and how they play. ‘If I went up front everyone would know what I would do, you believe you are familiar with all the players. ‘Obviously, with Oli not being a defender, we had to do a bit more talking and be a bit louder to try to help him as much as we could, but I thought he did really well. ‘He’s not going to get everything right, no defender does. ‘When told of that change at half-time it did surprise me, but you could see the logic in it with Craig Davies a big, physical number nine. ‘You needed somebody with a bit of physicality to play up against him and it was a good call because he did really well. ‘I didn’t ask Oli if he’d played there before. It looked like he had, playing at centre-half is quite an easy position. ‘When we heard Burge’s disappointing news, Nath was the obvious choice going into the match being a natural defender. ‘I don’t think Drew has played much as centre-half – in the moment it was just thrown together. Clarke turned 21 only 10 days ago, yet on Saturday was the senior figure in defence due to the makeshift nature of two of his partners. But he also had to maintain his own responsibilities. He added: ‘I have my job to do and don’t want to end trying to be a bit world beater and attempting Drew’s and Oli’s jobs as well. ‘They have to be responsible for their performance, even though I tried to help them as much as I can.